Watching football in the house of Cholo. Following the dismissal of Jose Mourinho from the hot seat at Chelsea, one of the names mentioned as a the long-term replacement is Diego Simeone, currently managing Atletico Madrid in La Liga. There’s a relationship already in place between the two clubs with players moving between them. Could El Cholo be the next one to move from the Vicente Calderon to Stamford Bridge? If the Bookies are right it could well be the case. 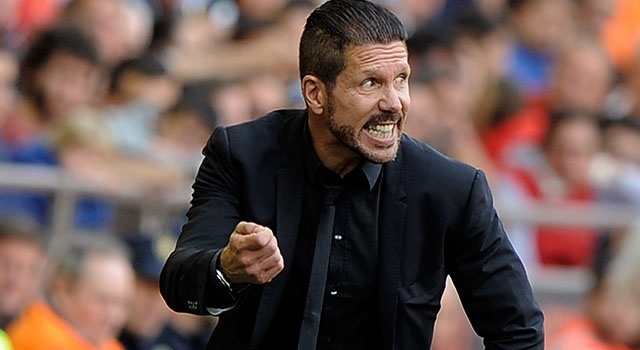 There is however, something special in the fit between the Simeone and Atleti. It’s something that just works; something that may not be transferable. It’s something I experienced earlier this year. Of all the cities that I’ve visited, Barcelona is probably my favourite. As a consequence, along with the wife, we’ve been there around a couple of dozen times, and being a bit of a football nut, I’ve also taken in half-a-dozen or so games at the Camp Nou. Over the years, I’ve been lucky enough to have seen many of the Barca greats strut their stuff there. Amongst many others, Rivaldo, Luis Enrique, Ronaldinho, Messi and Neymar have all plied their trade in front of me, and it’s been immensely enjoyable to watch. Due to the dominant duopoly of La Liga however, with the Catalan Blaugrana and Los Blancos of Real Madrid apparently forever holding sway, watching games there have been more like a command performance than a competitive match of sorts. A few years back, I saw Barcelona paly out a turgid draw with Valencia, but that was the only game they failed to win – and comfortably – in my presence. Now, there’s nothing wrong with that of course, but semi-foregone conclusions tend not to make for riveting, edge of the seat, excitement. With this in mind, in Novemberwe paid a first visit to Madrid, and wanted to take in a game, I wanted to see Atletico rather than Rafa Benitez’s Real. Of course it would be good to have seen the exploits of Bale, Benzema and the incomparable Ronaldo, but there’s something about the defiant underdog attitude and sheer competitiveness of Diego Simeone’s Rojiblancos that I find compelling. I wanted to see the Cholo effect. With this in mind then, on 28th November, we wrapped up warm and took the Metro to the Piramides station near to the stadium, in the he Arganzuela district of the city. The game was scheduled for a 6.15pm (local time) kick-off – it appears that it’s not only English football scheduling that is ruled by television requirements. When we emerged from the underground station therefore, it was still a bright and sunny early evening. The first thing we noticed when ascending the stairs was the chanting. You can look at all of the street plan maps in the world, but if you want to get to a big event, it’s probably best to follow the crowd, and that was what we did. From a few hundred yards behind us, as we crossed the closed off road just outside of the Metro station, apparently a crowd of Atleti fans were in fine voice. Although not uncommon in England, it was something that we hadn’t really experienced in going to games at the Camp Nou. I’m not saying it was like a Catalan Vicar’s Tea Party, of course it wasn’t, but walking along the Diagonal towards the stadium in Barcelona, the atmosphere was certainly more restrained. It was also noticeable how many fans were wearing Atletico shirts and sporting the club’s colours. In Barcelona – with some exceptions of course ‘smart casual’ was the dress code, and the only people sporting Barca shirts were either the uninitiated, or tourists. A couple of hundred yards from the station, we noticed that around fifty or so fans had stopped outside of a bar for a pre-match drink. When in Rome, and all that sort of thing, so we joined them. Inside, the bar was pretty empty, as most fans had gathered around the tables outside, or were standing around in groups. The beer was fairly nondescript, but the glasses – plastic ones – were the ‘double-sized’ ones that meant you only needed to go to the bar once. A quick glance around suggested that this was the thing to do, so deploying my best “dos cervazas, por favour, Senor” I got the drinks in, and with a “Gracias” from me and a “De nada” from him, we went back outside. The crowd around the bar had now grown to seventy or so I would estimate, but we still espied an empty table, albeit with no chairs, so moving over to it, we paced our drinks down. Noticing a couple of empty chairs at the next table, I attempted to deploy sign language to see if they were free. A very friendly Spaniard told me not, but then asked a couple of the neighbouring tables if any were free there. Apparently not, but it was a nice gesture. Eventually, we found a space on a low wall just outside the bar and settled down to watch the crowd drift by and observe our fellow drinkers. The large glasses required some patience to quaff, so there was plenty of time for people watching. We noticed how many young children there were along with parents going to the game. I always think that sort of thing is hugely healthy for the game. Passing on the baton laden with heaps of despair and lightning bolts of sparse but magnificent joy, to your kids is something of a duty we should all observe with a passion. We also noticed that, alongside the bar was the sort of shop that exists across so many big cities a town. The sort of establishment that has a Tardis-like quality, appearing small from the outside, but with an apparent infinite capacity to hold stock within it. Over the time we perched like Humpty-Dumpty, a number of fans went inside and returned with a bottle apparently containing spirits of some description. It was only then that we noticed that those not drinking beer from the big glasses, instead apparently forswearing alcohol for a cola-like concoction, were in fact priming themselves for a rum and coke cocktail, utilising the spirits from the shop. If someone had produced ice cubes from the freezer in the shop, it wouldn’t have been surprising. It was clearly a well-rehearsed and time-honoured tradition. We were quite close to one particular group, comprising four men and two women. All were well-animated, but speaking far too fast for my elementary Spanish to catch the drift of the conversation, but it was clearly about football, if not the upcoming game in particular. What was noticeable though was the passion on display. If this group was emblematic of the majority of Atleti supporters, this was going to be more of a passion play than a night at the theatre. Eventually, we moved on towards the stadium, and as we turned a final corner, the edifice of the Vicente Calderon honed into view. Compared to many other stadiums, the ‘Calderon’ is relatively modern, only opened in October 1967. That said though, this season is due to be Atleti’s last in their traditional home, as it is due for demolition with the club moving to the Estadio Olímpico de Madrid, more popularly known as Estadio La Peineta, to the east of the city centre, near to the airport. The new stadium will have a capacity of some 73,000, almost comparable to the 81,000 at the Bernabeu to the north of the city. Many fans however remain to be convinced of the merits of the move. Although the prospect of a new stadium – it’s currently being refurbished ahead of Atletico moving in, the move is not universally popular with Atleti supporters. The Asociación Señales de Humo (Atletico Supporters club) feel the move has much to do with money, very little of which will find its way into the club’s coffers. Plus, there is a spiritual attraction to the old stadium and its location. The Vicente Calderon certainly has the feel of a football ground. Walking from the Metro station, as the stadium comes into view, fans are walking down a wide a closed off roadway, forming a flow of people towards the ground. As with many stadiums these days, entry is via a barcoded slip of paper, and once through the turnstile – and having gone through the obligatory search – there’s a series of concrete staircases to ascend towards the seats. At each level however, there’s also a wide walkway with open views back down the road from where we had come. Being a little early still, we stood and watched the red and white tide of people moving towards the ground, with a few chants arising. There were also people hiring out cushions at one euro each. Being hardy types however, we merely scoffed at such things, and walked on to our seats. When we arrived at our seats, the first thing you notice that in the small holes at the rear of the seats, every one of them has grass growing through them. I’m not sure whether that says much about the growing climate in the south-east area of Madrid, or Castille in general, or about the way in which maintenance is perhaps being would down in the last rotation of a football season in the stadium. Either way, it’s a little disconcerting to almost be sitting on grass in the middle of a concrete bowl. It was now also clear that a cushion would have been a good idea. The number of people around us that had taken up the option suggested that they were regulars, and the absence of us having one illustrated that we were not. The stadium is comprised of a sweeping ‘U’ shaped bowl of seating, surrounding one side, and both ends of the pitch, with a squared-off stand on the other facing the other side. The unconnected stand being the only part of the ground covered, with the remaining areas exposed to the elements. We were positioned in the second tier of seating in what is termed the ‘Lateral’, the area forming the base of the ‘U’ shape, just to the right of the halfway line, facing the covered ‘posh’ seats of the ‘Prefencia’ opposite. Sitting next to me was a Spaniard of about the same age and his wife who were both clearly long-term supporters, but while she adopted a sit and suffer in silence approach to on field matters, he was more the vociferous rant type. Behind the goal to our left was the ‘Fondo Sur’, or what if often termed as the ‘Popular End’ where massed ranks of red and white decked Atleti fans chanted and encouraged their team with the sort of coordinated jumping up and down that was often the purview of fans supporting central European clubs. The ‘Posnan’ adopted by Manchester city fans being an example. It was the sort of area where I was convinced my neighbour would have stood as a young man. The initial chants varied between ‘Atleti’ and ‘Cholo’ the nickname of the all-black clad Simeone, pacing the touchline in front of his dugout. Sitting next to the wife was a Dutch man who apparently wouldn’t keep still and after disappearing at half-timer for a call of nature or refreshments – or perhaps both – didn’t reappear until 15 minutes or so into the second-half. Whether he got lost, waylaid or merely went for a stroll will remain an unsolved mystery the like of which no one is, or will ever be, particularly concerned about. When the game got underway, the promise was heightened with star player Antoine Greizmann flicking a pass from Oliver Torres into the far corner of the net to open the scoring. The Fondo Sur exploded and the amigo to my right jumped up and yelled in unison. It was a nratly taken finish, and increased an already held belief that Greizmann was destined for great things, perhaps being another of those players that Atletico buy, develop for a few years and then sell on at vast profit. It’s a well-trodden path with the likes of Fernando Torres, Sergio Aguerro, Radamel Falcao and Diego Costa already having travelled that particular road. The remainder of the first half failed to bring any further goals however, despite the constant prompting and penetrating runs of former Chelsea, and now returned, left back Felipe Luis. The half-time break offered ac chance to reflect on events of the first 45 mniutes. Ateletico were clearly the better side than the apparently disinterested Espanyol. That being the case however, it was significant to note that the home team had not ‘put the game to bed’ yet. Here was a team defined by its functionality. Well-drilled by Simeone, but in the main solid, with a few exceptional players to raise the standard when required. Oblak looked solid in goal and with Godin patrolling in front of him, a goal from the away team was ever looking likely. Further forward, both Oliver Torres and Vietto looked capable of creating openings, but another one hadn’t arrived. The second period began as the first had ended. Atleti were dominant but not really looking ike scoring. Godin sent a header from a corner narrowly wide and Vietto squandered a better chance when presented with a clear chance on goal. As time ticked away though, and the lead still slender, the man in black was seen on a couple of occasions to rouse the fans with whirling movements of his arms, seeking to ‘whip up’ the passion of the crowd to exalt his players to greater endeavours. The fans responded as if led by an orchestra leader. There’s something about the playing career, coaching approach and personality of Simeone that endears him to this working class club of Madrid. Whether such an approach would have similar effects across the city with the aristocrats in all white is maybe questionable, but it fits right in with Atleti. With around fifteen minutes left, to huge cheers, Simeone decided to throw Fernando Torres into the fray. Here was a a guy who at one time was one of the most-feared strikers in Europe, but on his way down the M6 from Liverpool to Chelsea apparently mislaid his ability, turning into a £50million busted flush. His performance in the last knockings of this game suggested that not much had changed since forgetful motorway journey, despite a late effort striking the upright. The game ended in a 1-0 win, with Greizmann’s goal as the sole tangible expression of a gulf of difference between the teams. It used to be said that the Pele-inspired Brazil team of the late-sixties and early-seveties had a philosophy of ‘you may score, but we’ll score more, Atleti’s functional approach is more of ‘we may not score many, but you’ll score fewer’ it works however and if it’s a manifestation of Simeone’s approach, the fans have little problem with Cholo’s way of doing things. Leaving the game, we headed back to the Metro station, but swayed by the movement of the crowds, we took a wrong turn and ended up walking an entirely different way. In a city with good Metro links however, you’re rarely far from a station, and the strange appearance ahead of us, suggestive of people disappearing down some kind of plughole suggested we’d found one. We descended, found our way back to the hotel, changed and went out for dinner suitably late, as is the way in Madrid. Going to watch Barcelona play and doing the same with Atletico are totally different experiences. One offers the prospect of high theatre with skills and virtuoso performances almost expected, whilst the other is more a manifestation of a game people can aspire to, and certainly identify with. There’s an air of sophistication in Barcelona, that contrasts with the gritty determination of play and atmosphere of watching football in the house of Cholo. Would Simeone’s approach work at Chelsea? I guess it’s difficult to say. Jose Mourinho’s combative demeanour may have worn a little thin by the time he left, but if El Cholo takes over in the summer, there may be more of the same to come. I understand this was written a while ago but I’ve just found this blog and what I am reading is fascinating so well done. Just a point though. Torres if I remember correctly was injured prior to his transfer to Chelsea so the assertion that he “lost” his abilities whilst transferring to Chelsea may not necessarily be true. Thanks for your interest and nice comments about my articles. It’s an interesting point. Yes, he did suffer a knee injury in his last year with Liverpool, and personally, I’m of the opinion that he was never the same player again – I covered this in my first book. That said, he did pass the medical with no apparent issue, and when you’re laying out £50million or so, you’d think the examination would be thorough, especially if there had been a recent injury. Spot the ball: Search for articles on…. Keep up with the play!